Sihinaya Villa is our beautiful Sri Lankan, full service holiday villa with pool and it is perfect for family or friendship groups looking for a luxurious, family friendly property with exclusive use. 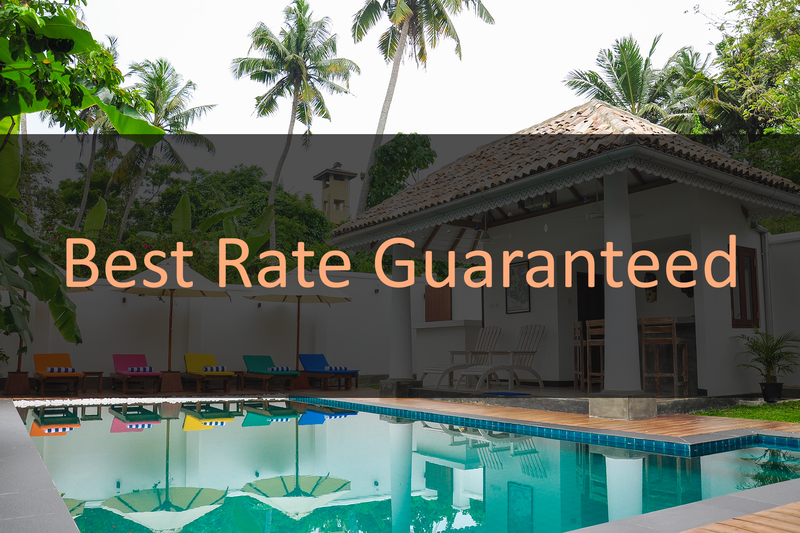 We are situated in a peaceful area of Weligama, one of the top surfing and diving hotspots of the world, but just a five minute Tuk Tuk ride away from all the excitement of the main beach and town area. Our simply stunning villa, a 100 year old antique house, has been sympathetically restored by craftsmen to create a light, airy and relaxing atmosphere. It has been furnished in a luxurious but comfortable style, keeping the needs of our guests in mind at all times. The Villa has four king size air conditioned bedrooms, all furnished with gorgeous beds made from locally sourced wood. We have three en suite bathrooms with open to the sky showers and the master bedroom also has a decadent free standing bathtub. A large colourfully decorated open plan living area at the rear of the villa overlooks the pool and is cooled by the breeze and the overhead fans. Here you will find a large handcrafted dining table where long lazy lunches and dinners can be enjoyed by our guests. The Villa has its own beautifully private tropical walled garden with swimming pool and is just two short minutes walk away from a small secluded beach. Just imagine relaxing in our hammock under the swaying palm trees watching the many colourful native birds, peacocks and the occasional passing monkey who visit our garden! The Villa is fully staffed by our Chef, Housekeeper, Steward and Manager who all work from the separate staff quarters located in the grounds of the villa. They are always discreet which ensures the privacy and relaxation of our guests, whilst at the same time assisting them to have a wonderful holiday experience. At Sihinaya Villa we pride ourselves on providing superb service, delicious food and luxuriously comfortable facilities in an amazing setting. Please leave the amount of rooms as 1 to book the entire villa.